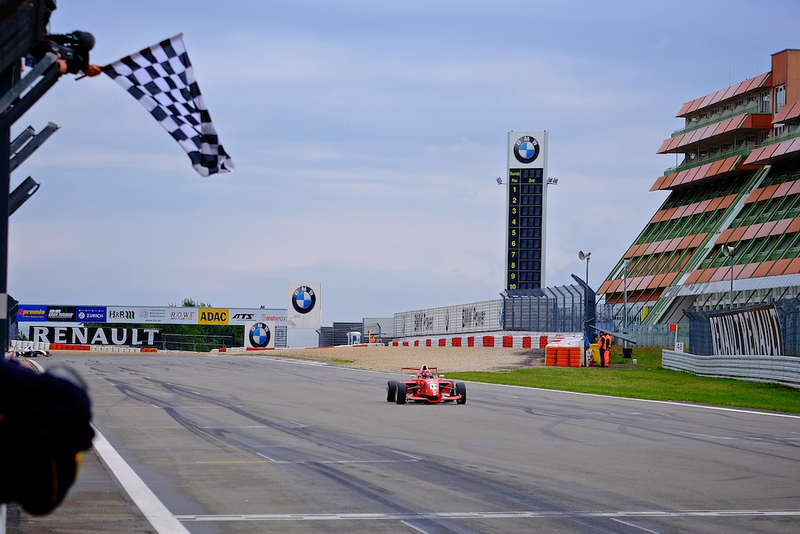 At the Nürburgring this weekend, Anton de Pasquale secured his third and fourth victories of the Formula Renault 1.6 NEC season. For a time in Race One, Janneau Esmeijer headed de Pasquale, however the 17-year-old Dutch racer was given a drive-through penalty on lap six for jumping the start, promoting poleman de Pasquale into the lead. Thereafter de Pasquale led with ease from the slow starting Larry ten Voorde (2nd) and Max Defourny (3rd); both of whom ran close throughout, while Esmeijer battled back up to 4th. The race start did provide some entertainment when, along with Esmeijer, four other drivers jumped the lights. De Pasquale repeated the effort on a wet track in Race Two. The Australian initially pulled away from Voorde, only for Esmeijer to rise to 2nd on lap two. Esmeijer pressed for a time, but ultimately had no answer for de Pasquale, who pushed outward to win by 5.29s from the Dutch teenager, while Voorde finished a distant 3rd. Defourny took 4th from Boris Kolff late on to solidify the top five. The results ensure de Pasquale has an almost untouchable lead going into the next round at Assen in a few weeks time.